A brief outline of the untold radical history of popular grassroots resistance on the East coast of Scotland. Not all events mentioned are anarchist or possibly something I would support in full. Hopefully this will allow for the writing of a much more in-depth larger work in the future. 1780- Bowed Joseph died. Bowed Joseph born in the cowgate was a famous Edinburgh agitator and took part in riots. 1865-Midlothian farmworkers' union set up. 1867- Thomas Hastie Bell born. 1876- Kropotkin lives in Edinburgh for a brief time. 1881- Irish nationalist bombs loanhead police station. 1882- Kropotkin returns to Edinburgh to give a lecture on the russian situation. 1889- School strikes. Dockers Strike. 1891- Railway workers strike. Dockers strike. 1892- Thomas Hastie Bell returns to Edinburgh and involved in anarchism with J. Blair Smith and McCabe. 1895- Sept 14. Emma Goldman lectures in Scotland. Visits Edinburgh. 1896- Tsar Nicholas 2nd visits Leith. Thomas Hastie Bell gets in his face. 1898- Thomas Hastie Bell goes to London. 1900- Emma Goldman visits Scotland again for lectures. She meets Thomas Hastie Bell. 1911- railway strike, school strike, ropeworkers strike. 1915- Leith carters strike. Dockers strike. 1933- National Unemployed Workers movement in Princes Street. 1938- March 6-13th Emma Goldman lecturers in Scotland on Spain. She received help from the Anarchist Communist Federation the predecessor to the Anarchist Federation. 1942- Thomas Hastie Bell dies. 1943- National League of the Blind and disabled sets up an Edinburgh branch which exists until 1975. 1977- protests against nuclear power. 1981- Broughton Unemployed Workers Centre opens. 1984- Counter information news sheet produced. Miners Strike. Violent resistance to the police in Midlothian particularly Bilston Glen colliery . 1987[/b ]Anti-poll tax movement. Successful mass community-organised poll tax non-payment movement. [b]1994- Broughton Unemployed Workers Centre evicted. Protests against criminal justice bill. 1997- The Autonomous Centre of Edinburgh is opened at West Montgomery Place. 2002- Bilston Glen Protest camp begun next to Bilston in Midlothian. 2003- Protests against Iraq War. School kids occupy Edinburgh Castle. 2005- G8 riots in Princes street . 2011- Occupy Edinburgh set up in St Andrews Square. 2014- From Yes to Action Statement produced by ACE and signed by Edinburgh Coalition Against Poverty(ECAP) , Scottish IWW, Edinburgh Anarchist Federation and others. Edinburgh Anarchist Federation puts out critical statements about Scottish Independence. ECAP blockades The Salvation Army which is using workfare. 2015- Action Against Austerity Network founded in Edinburgh which comes to consist of ACE, ECAP, IWW, Scottish AFed, Scottish Unemployed Workers Network(SUWN) , Castlemilk Against Austerity, Dundee Against Austerity etc ...Charles Stewart House is occupied by Edinburgh Uni students. PCS museum workers strikes. ECAP blockades Debra Shop in Stockbridge which is using workfare. 2016- Homeless campers occupy the cowgate in protest against luxury hotel. Charles Stewart House is occupied by Edinburgh Uni students. RMT railway workers strikes. Edinburgh University Student riot 1838 though alleged because it seems to concern merely snowball throwing. 1350- 1850= Little Ice age. 1730s- Guilds form in Midlothian. 1776- Adam Smith publishes wealth of nations. 1790- Pre-chartist radicals e.g. Thomas Muir. 1792- London Corresponding Society formed. King George 3rd birthday riots. First edinburgh meeting of Friends of the People Scotland. Edinburgh Gazetter starts publishing. 1793- Thomas Muir arrested. French Enrages(pre-anarchists) appear in the French Revolution when Jacques Roux delivers the “Manifesto of the Enragés. Reign of Terror. Committee for Public Safety created in france which becomes an authoritarian dictatorship. 1794- Polish revolt. British Habeas Corpus Suspension Act 1794 passed by Prime Minister William Pit the younger. 1796- Massacre of Tranent. Radical bookseller Alexander Leslie is trading. 1797-Spithead and Nore Mutinies in England. 1799-1800= Combination acts ( basically anti-protest, anti-strike laws) passed. Napoleon seizes power in a Coup in France after accusing the Jacobins of planning a coup. 1803 Napoleonic Wars. Prisoners held in Penicuik. 1806- Henry Dundas, scottish politician, Tory and enemy of the abolition of slavery, is impeached. 1807- Britain declares slavery illegal. 1818 Frankenstein published by Mary Shelley. 1825- Combination Act passed which allows trade unions but limits their activity. 1832- Britain passes reform act. 1833- slavery banned throughout british empire. Anti-slavery abolition groups formed in Edinburgh, Edinburgh born Quaker Eliza Wigham is involved. 1834- Tolpuddle Martyrs deported to Australia. 1839- 1860 1st and 2nd Opium wars. 1840- European Potato famine.Proudhon publishes What is property kicking off anarchism as a political movement and philosophy. 1846-1852- Great Irish Potato Famine. 1848- Communist Manifesto by Marx published. Senecca Falls womens rights convention in the US. 1857= Anarchist Joseph Dejacque writes a letter critical of Proudhon's Mutualism, sexism and anti-semitism. 1859- Darwin publishes on the origin of species. 1864- Annuity tax riot. First international aka International Workingmen's Association(IWA) formed. 1865-Midlothian farmworkers' union set up. Abe Lincoln assassinated. 1866- First International's first congress in Geneva. 1868- Bakunin joins the first International. 1867- Thomas Hastie Bell born. Marx's Das Kapital first published. 1871- Paris Commune. William Gladstone's government passed The Criminal Law Amendment Act which banned picketing and industrial actions like sabotage. 1872- Split between statists and anarchists in the First International. St Imier anarchist conference in Switzerland. 1876- Bakunin dies. First International dissolves. Kropotkin lives in Edinburgh for a brief time. 1878-1880= William Gladstone's Midlothian Campaign. 1879- Freiheit (German for Freedom) German anarchist publication started in London by Johann Most. It was published in London until 1882. 1880s- friendly societies for mutual support (pre-welfare state insurance organisations) form in Midlothian. 1881- Irish nationalist bombs loanhead police station. Broxburn miners strike. Social Democratic Federation(SDF) founded including members William Morris, James Connolly etc. 1884- SDF splits over Hyndman's behaviour .William Morris lectures in Edinburgh. Edinburgh University Socialist Society formed- one of its key founders being Léo Meillet, who had been active in the Paris Commune as a member of the "Committee for Public Safety" . National demonstration of Women 22nd March. 1885- Socialist League, the split organisation from SDF is formed. In Scotland the Scottish Land and Labour League severed its connection with the SDF to join the new organisation.Arbeter Fraynd (meaning "Worker's Friend" in Yiddish), was a London-based weekly Yiddish radical paper founded by socialist Morris Winchevsky. 1886- Haymarket Massacre. 8hr Day. May Day announced as International Workers Day. Anarchist Freedom Newspaper begins in London. International Exhibition of Industry, Science and Art hed in the West of the Meadows Edinburgh(6th May-30th October). 1887- Socialist League became anarchist influenced, authoritarian socialists didn't like this. Joseph Lane publishes Anti-statist communist Manifesto, an anarchist reply to Marx. William Morris argues for abstention from elections. 1889- Socialist League entirely anarchist. School strikes. Dockers Strike. Mauricewood Mining disaster. Commemorations of the Paris Commune. 1891- Caledonian Railway workers strike. Dockers strike. 1892- Thomas Hastie Bell returns to Edinburgh and involved in anarchism with J. Blair Smith and McCabe. Miners strike. 1893- the Scottish Labour Party(SLP) adds declaration of its aims, to include ''the co-operative ownership by the workers of land and the means of production''. 1893- anarchist meetings in Edinburgh. 1894- publication Liberty: a journal of anarchist communism founded in London. 1900- Emma Goldman visits Scotland again for lectures. She meets Thomas Hastie Bell. Germinal anarchist Yiddish journal begins publication headed by Rudolf Rocker. 1901- Tramworkers strike. Socialist League disbanded. 1914- suffragette tries to blow up Roslin chapel. 1919- School strikes. Port Edgar South Queensferry mutiny over Russia(pro-Russian Revolution). 1921- National Unemployed Workers Movement(NUWM) founded. 1926- riot in Edinburgh. UK-wide General Strike. 1928,1930,1932, 1933- Scottish Hunger Marches to London by the NUWM. 1929- From this time onwards, Italian fascists inspired by Mussolini are active and known to be in Edinburgh at 20 Picardy Place. 1938- March 6-13th Emma Goldman lecturers in Scotland on Spain. She received help from the Anarchist Communist Federation the predecessor to the Anarchist Federation. Edinburgh Spanish Relief Committee formed by Councillor Tom Murray. Edinburgh and Lothians folk fight in Spanish Civil War. United Socialist Movement(USM). 1940- Anti- italian riots in Leith. Italian Internment. 1943- National League of the Blind and disabled Edinburgh branch until 1975. 1958- Scottish CND protest in Edinburgh. 1960 or 1970s- protests relating to Hastings Banda of Malawi. 1961. Scottish CND protest in Edinburgh. 1965- protests against Vietnam war in Edinburgh. Rhodesia declares independence from Britain. Britain imposes sanctions. Protests in Edinburgh against the sanctions. 1970- Anarchist publication Black Flag founded. 1976-Peace People march against violence in Northern Ireland, 1976. 1977- protests against nuclear power at Torness(as described in the Aberdeen Solidarity publication). 1978- Firemen strike. Farmers protests. 1979- Edinburgh students protest rent increases with a sit-in. May 1978- May 1979- Torness anti-nuclear power protests.The Scottish Campaign to Resist the Atomic Menace - SCRAM (headed by Pete Roche); the Torness Alliance (nationwide network of activists)Lothian and Borders Anti-Nuclear Group .Students Against Nuclear Energy (SANE); the London Greenpeace; the Socialist Workers Party; hybrid groups containing mixtures of Friends of the Earth (FOE) and anti-nuclear activists, anarchist groups, pacifist, environmental and other direct action groups; friends and acquaintances. 1979-1994= Direct Action Movement forms from Syndicalist Workers Federation. They are involved in Anti-poll tax. 1980s-Tenants at a block of flats in Muirhouse, North Edinburgh, display a banner to raise awareness of poor housing conditions in the area and the lack of adequate maintenance. 1981- Broughton Unemployed Workers Centre set up. 1983- Leith dockers strike. Die in against Acid rain. Anarchist group Class War founded. 1984- protests against acid rain and against nuclear power. Edinburgh students protest against Apartheid. 1986- Anarchist Communist Discussion Group becomes Anarchist Communist Federation. 1990s- Scottish anarchist magazine published by scottish federation of anarchists(SFA). Anarchist Federation formed. 1994- Schnews from Brighton founded. Solidarity Federation formed from Direct Action Movement. Broughton Unemployed Workers Centre evicted. Protests against criminal justice bill. 1997- Autonomous Centre of Edinburgh formed. 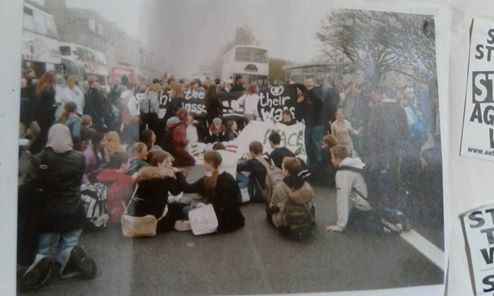 2002- Bilston Glen Protest camp begun by Bilston, Midlothian. 2005- G8 riots in Princes street related to Gleneagles. 2014- From Yes to Action Statement produced by ACE. Edinburgh Anarchist Federation puts out critical statements about Scottish Independence. 2015- Action Against Austerity Network created founded in Edinburgh. Charles Stewart House is occupied by Edinburgh Uni students. PCS museum workers strikes. Made a few revisions based on friendly suggestions.